One of my hobbies is a passion for Formula One racing. It started when my best friend introduced me to the sport twenty years ago and I was hooked. I’m not one of those F1 snobs but there is something elite about this class of motor racing. The cars are trickier to drive, the season is gruelling, the traveling is unrelenting and the varied road courses have eaten up some of the most gifted drivers to ever get in a car. Every premiere level of sport has its best of lists. Who is THE best? What names fall into the top ten? Gretzky, Federer, Woods, you have your list. And in Formula One, my top vote would go to Ayrton Senna. Seven time world champion Michael Schumacher puts Senna at the top and so do many other drivers. "You touch this limit, something happens and you suddenly can go a little bit further. With your mind, your power, your determination, your instinct, and the experience, you can fly very high." Senna was an animal on a road course. He made no excuses. He would drive you into the wedge and make you move out of the way. In 162 F1 starts over ten years, he made the podium (top three) 80 times, won 41 races and secured the world championship three times. Aryton Senna died in 1994 while leading the San Marino Grand Prix. As one commentator said, he simply ran out of road. In his home country of Brazil, millions attended his funeral and there were three official days of mourning. Senna gave millions to charity through his foundation which lives today and loved his country very much. But battle him on track and you may just want to move aside or he did it for you. He was born to race. He was born to win. This month, there is a film simply entitled Senna about his life coming out in North America that is the highest grossing documentary in the UK history. "You must take the compromise to win, or else nothing. That means: you race or you do not." So how does the story of Aryton Senna help our career? How does it help our business? He did everything to win, period. One season, the championship was his, if rival (and fellow F1 legend) Alain Prost didn’t finish. So Senna blew Prost into the first corner and ended both their day. The crown was his. And this happens in the enterprise. Some will do anything to win even if it means destroying their competition. To win in racing, you cross the finish line first. In business, you are in a much longer battle. But all so often we hear ourselves talk about increasing revenue, improving market share, crushing the other guy and how does that help? 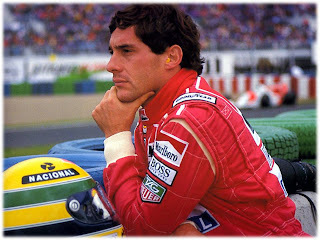 Senna was concerned about winning for him and his team and often would put others in harm’s way. Off the track, he was a kind and gentle philanthropist. Fellow drivers revered him. Fans adored him. So it looks on the surface that he had the right strategy. Prost once remarked that Ayrton didn't think this would kill him, in fact, it didn’t even occur to him. And of course the unthinkable happened. Do you know how to define your win?